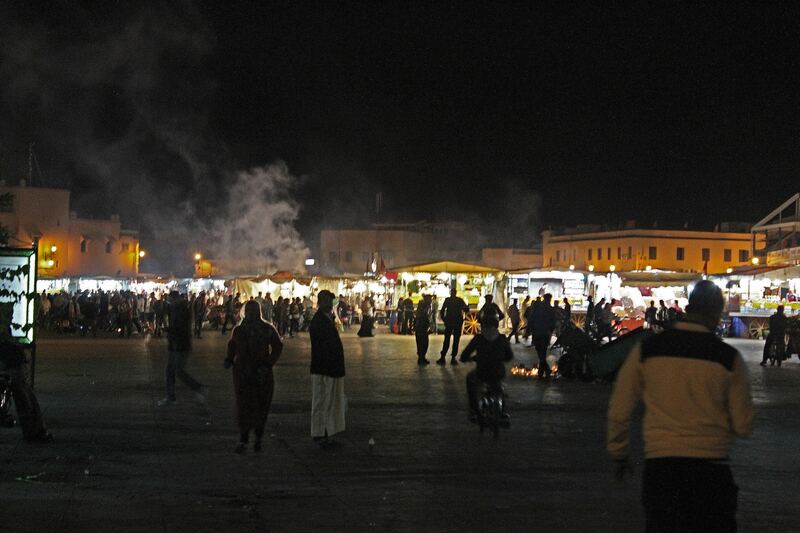 as we had approached tenghir i overheard the sues talking about making ‘smores, which caught my attention. i had been editing photos on my laptop, but when i heard the debate as to the correct preparation methods, i had first been curious, and then alarmed, when i heard sue #2 describing something involving a tea biscuit (the english version of a cookie or a sweet cracker), chocolate sauce, and a marshmallow in tin foil and cooked in an oven or microwave (or some bastardized version of my bastardized summary of her bastardized gross misinterpretation of the american ‘smore). i sat there for a few moments not knowing if i should laugh or cry. the ‘smore is an american institution, and it had never occurred to me that the rest of the world didn’t enjoy or comprehend this poor-man’s delicacy like we did. furthermore, i had assumed that the film “the sandlot” had been just as much a part of everyone’s childhood as it had mine and every other american kid born in the 80s or 90s, and due to that iconic scene in the film where ham teaches smalls how to make a ‘smore, i further assumed that everyone knew how to make one on that basis alone. i had to intervene. “whoa. hold on. i don’t mean to be the know-it-all, interfering american here, but this is something that i am a resident expert on, and there are a few major injustices i need to correct here…” suddenly, everyone was looking at me curiously as i began to explain not only the proper ingredients and methods for the perfect ‘smore, but also the integral place it had in recreation and pop culture in the US. so the following morning, i forced our driver to make a pit-stop where we could make a quick supply run. he pulled the van over to a little market that didn’t really have any of what i needed, but i made due with the 6 different types of chocolate bars i bought (because i can’t read arabic), as well as the three different types of cookies and sweet crackers (since graham crackers are apparently a uniquely north american thing), and about 10 bottles of wine we were able to procure from behind the counter (buying booze is kinda hard in morocco sometimes. it’s not as readily available as it is in western society, due to its rocky relationship with islam: technically not allowed). they also didn’t have wire coat hangers, so i bought a bunch of kebab skewers for the ‘mallow roasting. the marshmallows were the only thing that were easy to find. not to worry, however, because my plan was to get everyone good and drunk off the wine so that if the ‘smores were terrible due to my makeshift ingredients, nobody would have a clue. 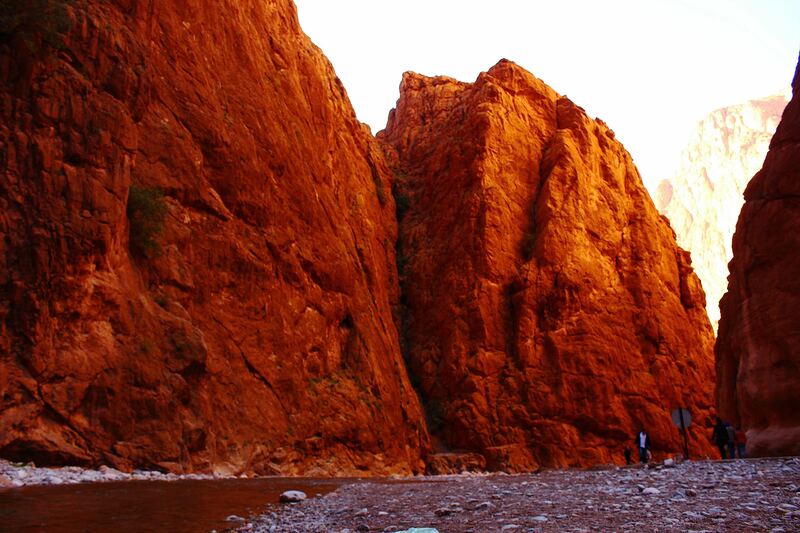 we loaded back up into the van and shot north for a quick detour to see the todra gorge, a small canyon with steep cliff walls made of red earthen rock and clay, and a trickling river rolling through the center of it. we piled out of the van to snap some photos when zuzu instructed to walk the last mile of the gorge to where he would be waiting for us in the van. i was glad for some physical activity finally. 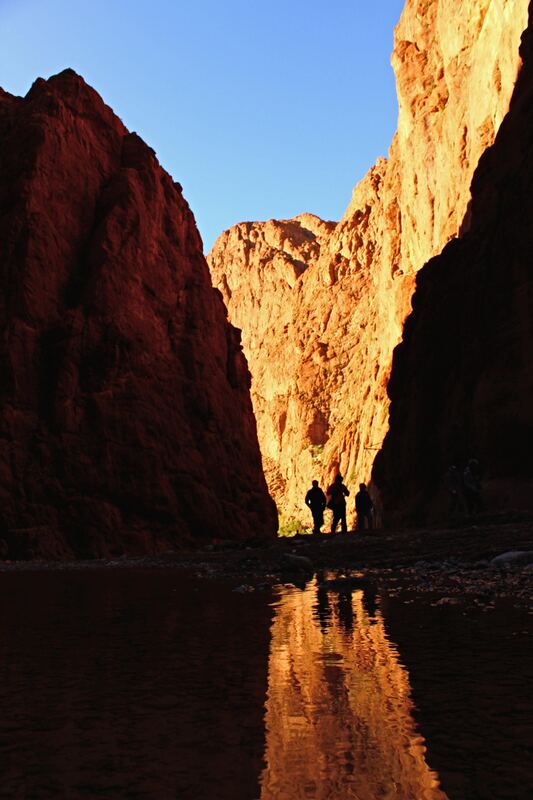 we stepped off the road and started walking along the small dribbling creek bed , hopping from rock to rock and crossing streams of deeper water when necessary via long wooden planks placed there by locals. we had managed to catch the gorge before the sun had risen too high in the sky, and the early morning sunlight crept slowly down from tops of the canyon walls and from the mouth of the entrance like an inevitable forest fire, an angry demon consuming everything in sight and only limited by time. the shade felt nice, and jeffrey and rachel took off their shoes and began to wade down the creek. 3 hours later we had pulled into another town for lunch and then abandoned the luxury van for a pair of 4-wheel drive SUV’s. as we were loading up the new vehicles, a old woman approached us, attempting to sell us bedouin scarves. my gut reflex responded and i immediately declined politely, but as gugu and surjit began to look (a pattern had emerged with our group. whenever we had been taken to a place where shopping was encouraged – which was kinda everywhere – all the australians and myself had abstained, and gugu and surjit had at shopped and bargained. we all joked that gugu and surjit had bailed out the rest of the group from looking like a bunch of cheap bastards) i realized i really wanted a scarf so i could learn how to tie a headwrap/turban thingy. 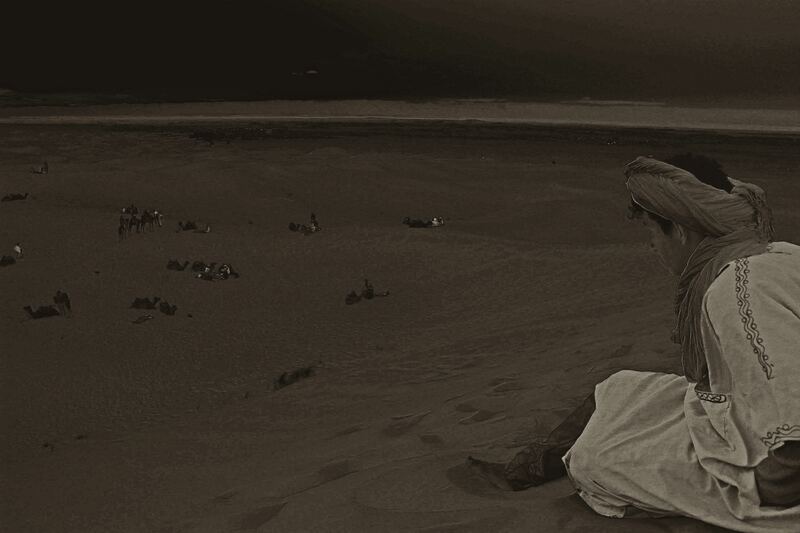 i wanted to play lawrence of arabia in the desert. before i knew it, everyone in the tour had purchased one, and the woman was holding a roadside course in scarf wrapping. 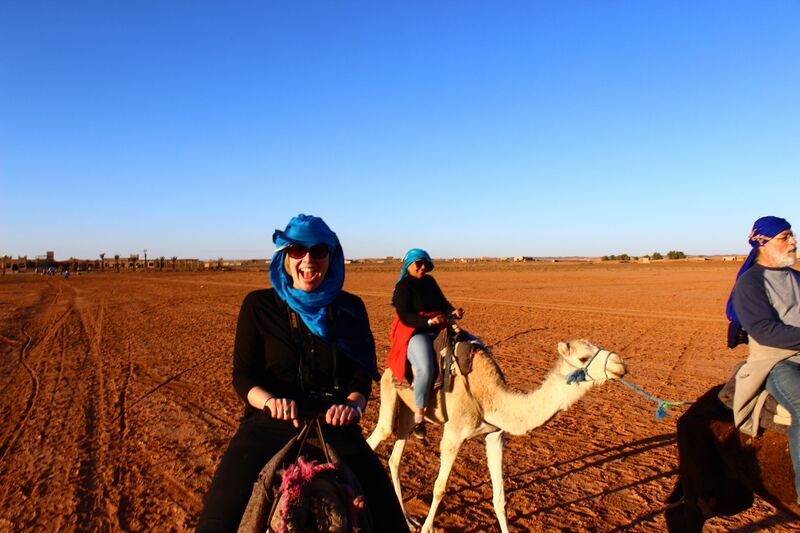 zuzu herded us back into the 4×4’s and we were off into the sahara via merzouga, cruising across wide expanses of nothing but sand as far as the eye could see. 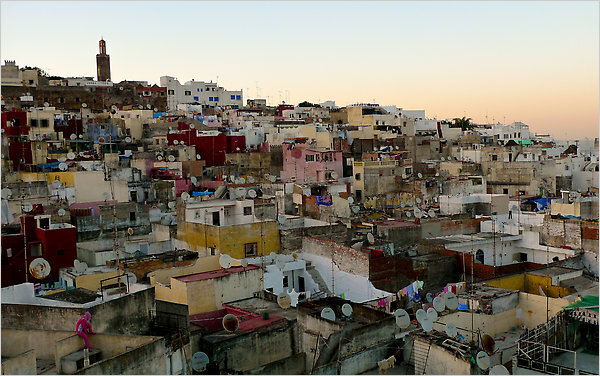 a strong ridge resided directly to the east, which we were informed was the algerian border. not a safe place to wander to. we weren’t worried about it however, as the offroad vehicles bounced and tore their way through the sand dunes, further and deeper, until we arrived a couple hours later to a cluster of palm trees and a grouping of tents and a small building. we had arrived. the sahara desert. a few young men hurried out from the building and began grabbing our bags to take them to our assigned tents. meanwhile behind us, a grouping of camels had assembled behind us with a few men in brightly colored robes holding the reigns. “okay my friends! 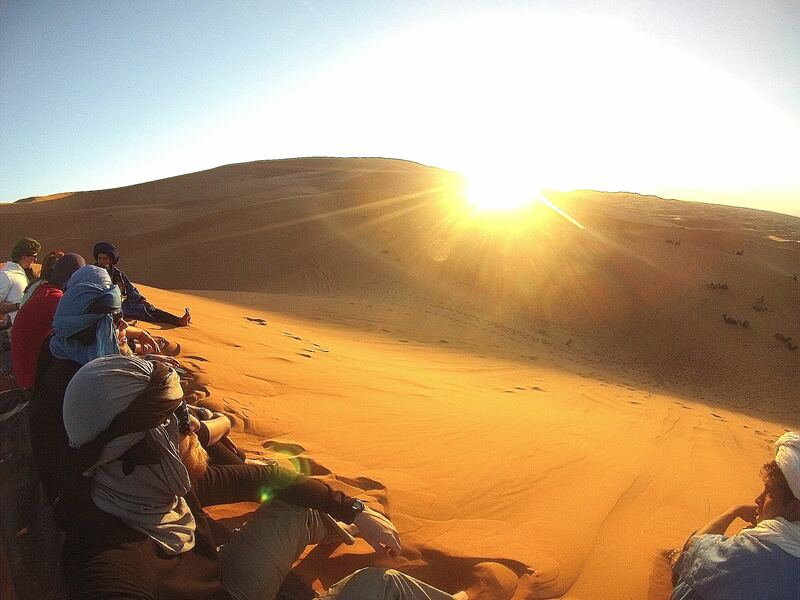 welcome to our berber camp in the sahara desert! 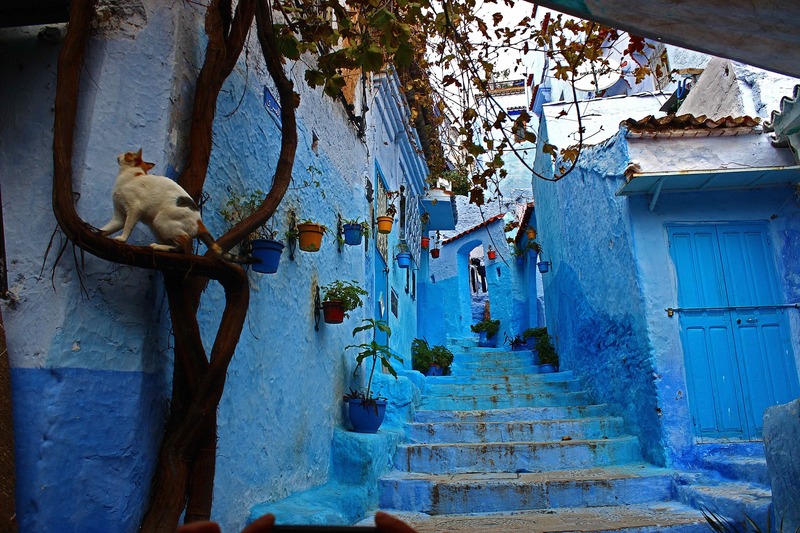 tonight we will be having a wonderful berber dinner with some music and big fire under the stars! 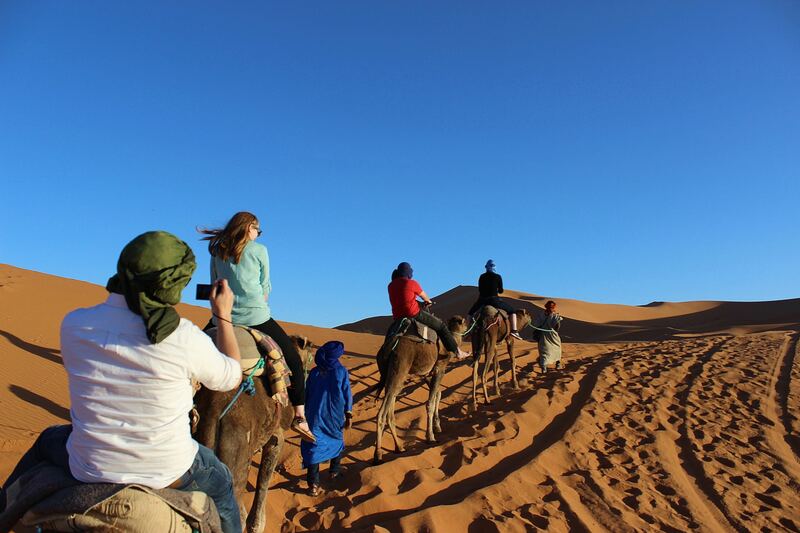 but for now, we have arranged for a beautiful camel ride up to the top of the sand dunes to watch the sunset!” zuzu led us over to the camels where a group of boys, none of them over the age of 20, began assigning us to camels. i could barely contain my excitement as i approached my camel, laying on its stomach in the sand. this was one of the things i had wanted to do all my life. 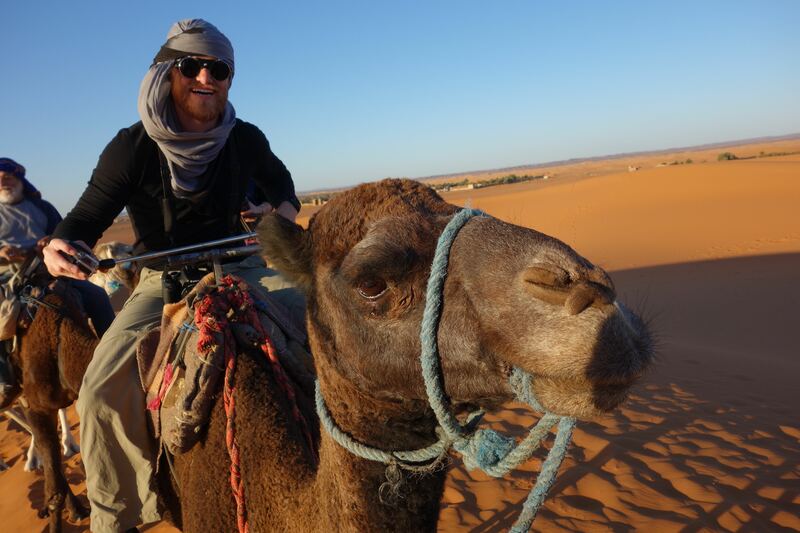 i didn’t know many people who had ever ridden a camel, much less in the vast sahara desert. it was one of those surreal moments, and i tried my best to savor every detail and every moment, to preserve it so i would never forget it, but i’m not sure it worked, because even today it still seems like a shadow of a memory. as though someone else had told me a story and i had simply made it my own. 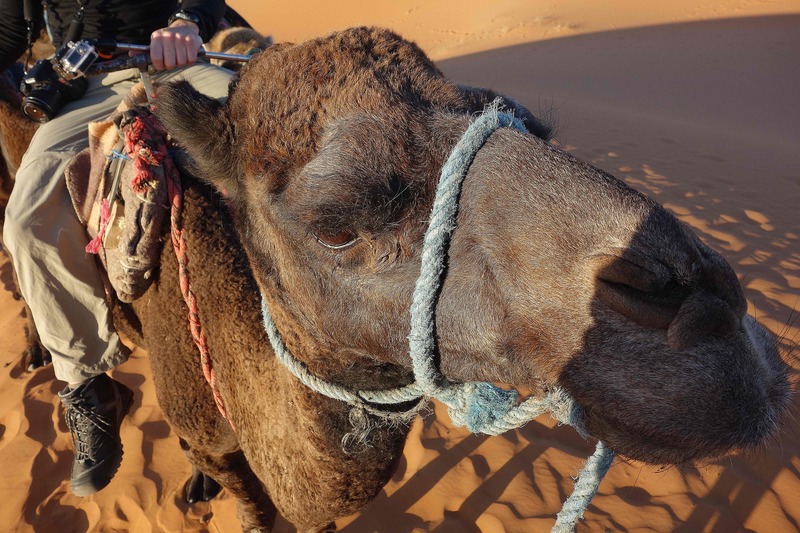 i kicked my shoes off and swung a leg over the back of the dromedary between his two humps, and he barked a hideous, throaty protest at me. i laughed back at him. the guide in front of me pulled up on the reins and suddenly the beast’s front two legs pushed up and shot me backward. “WOOOOO!” i joyously shouted, grabbing the saddle knob and throwing my free arm up into the air, like i was riding a bucking bronco in a rodeo. the camel collected its rear two legs underneath and pushed upward and suddenly i was sitting 8 feet up, on top of the world. we lumbered off single-file into the desert, climbing higher and further into the sand dunes as the sun began its race to the horizon, causing our shadows to grow until they looked like a herd of shadowy giant spiders making their way across the sand. 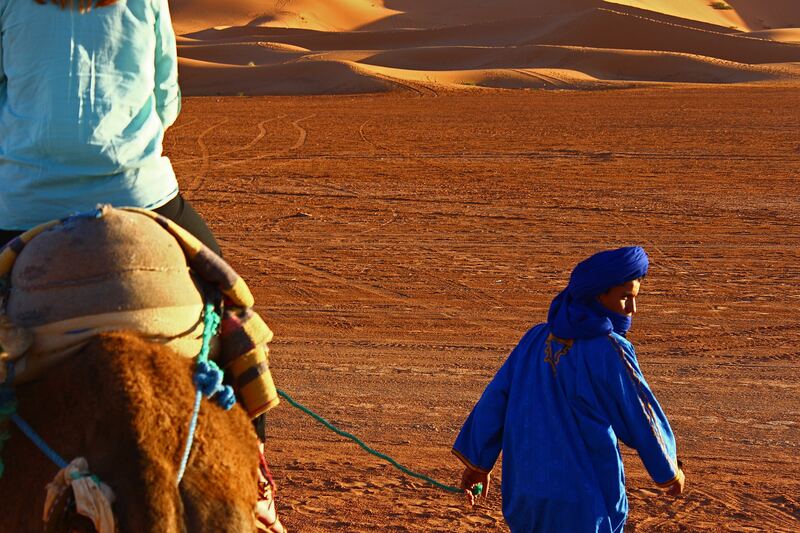 a few berbers walked alongside our caravan, ensuring the moody camels behaved and stayed in order. 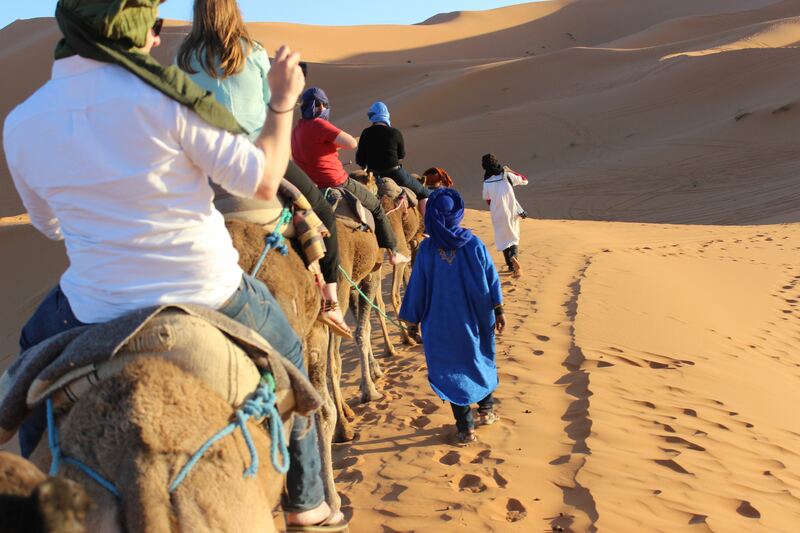 they made small talk, asking us about ourselves, telling jokes, even informing us of our funky camel friends’ names. Camby and Suey’s camels arguably had the coolest names, in jimi hendrix and bob marley, allegedly due to their hairstyles, though i didn’t see the resemblance. we parked the camels in a flat at the base of a steep dune and then all ascended the quick walk to the top, settling in on some blankets the berber guides had laid out for us. 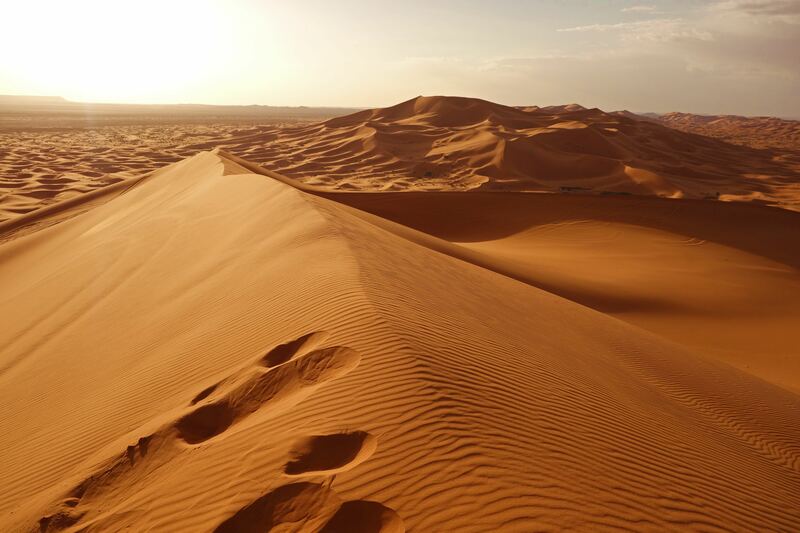 i couldn’t believe how incredibly soft the fine-grained sand was as i dug my bare feet deep into the surface, like a bed of cool silk coating the harsh desert terrain. our timing couldn’t have been more perfect, as the sun had just begun its final descent, and the light was beginning to alter and color as it entered the thicker parts of the curved atmosphere. a soft breeze drifted coolly along the dunes, brushing back my hair and pushing loose grains of sand into small swirls that danced along the ridgelines of the dunes. 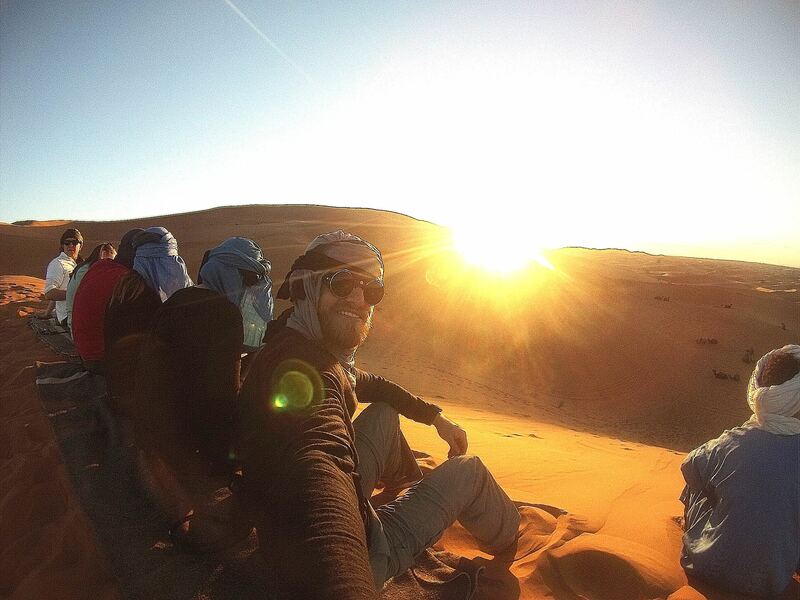 i took a deep breath and closed my eyes, letting the sunlight paint my face with the last remaining warmth of the day before the dry cold of the night invaded the sahara. everything was perfect. i had made it. the aussies sat next to me, chatting amongst themselves and enjoying the experience, but i was worlds away, quietly savoring the moment and reflecting on my journey to this point. the big decision to leave home and career and comfort, the volcanoes and glaciers of iceland, the canals of amsterdam, the amazing symmetry of paris, the history, intrigue, and elegance of the central european countries, the swiss alps, the poetry of spain, and now the sahara desert. a smile slowly crept across my face until it turned into a mad grin, and i began laughing. how was this my life? how had i gotten here? who did i think i was? i felt like i had somehow stepped into someone else’s life, and i was living their adventure. i kept waiting for someone to look at me and realize that i was an impostor, a fake, and chase me out. but here i was, and i didn’t want to stop. the night had descended upon the desert and everyone was sitting around a roaring fire stretching up 5 feet high into the black of night, casting its light all around and throwing shadows as far as the leash would allow. nearby a young man was slapping at a bank of bongo drums, introducing a rhythmic symphony into the quiet solitude of the desert. he sang in a low tone, his voice soft but confident, carrying its somber tale to our ears without the need for interpretation. i looked around as everyone happily sat around the fire, enjoying their wine or other drinks. a few children had joined the musician and begun pounding indiscriminately on the drums as he laughed and gave up trying to control them. the soft melody quickly devolved into chaos. this was the perfect time. i got up and ran swiftly back to my tent and grabbed the supplies. i quickly passed out the kebab skewers and assembled the chocolate, crackers, and marshmallows at a clear space a safe distance from the flames. i gave everyone a quick demonstration of how the ‘smore is made, taking care to show the difference in methods between the patient golden-brown approach and the more to-the-point “just set it on fire” preference. within moments, everyone was crowded around the bonfire, kebab skewers outstretched, and testing themselves at the art of the ‘smore. australians and moroccans alike stuffed their faces with the delicious american delicacy, and i stood nearby, smiling proudly. i watched as the young boys from the bongos took their first bite and smiled wide as soon as they could taste what they were eating. they quickly began begging for more, and i laughed and opened the cache of sweets up to everyone for as much as they wanted. after a couple hours of shared stories and laughter around the fire, most of the group had gone to bed. there had been some talk of rising early in the morning to watch the sunrise. as the aussies and i headed towards our tents, we discovered an elevated but flat patio area with some chairs and tables nearby. we took the wine and the six of us stayed out under the stars for another 2 hours, marveling at the view. i’m not sure i’d ever seen so many stars in my life. not even 10,000 feet high up in the colorado rockies. out here in the sahara, the milky way seemed to be burned into the dark canopy of night, and it glowed with an eery, hazed permanence. if you stared straight at it, it seemed to lose it’s form, and your eyes would begin to play tricks on you. but if you averted your eyes ever so slightly, your peripheral vision would reveal a wondrous, colorful tapestry with immeasurable depth that would play tricks, this time not on your eyes, but your imagination. my mind couldn’t comprehend its power and its beauty and its vastness all at the same time. distinct hues of green, purple, and yellow hid among the twinkling brilliance of millions of stars all around, and we sat breathless in the cool night air, our heads tilted upwards in a curious stupor. i felt so small, pitted somewhere between the stars and the sand, with each abyss, above and below, staring straight into my soul with brutal but gentle honesty. there was everywhere to hide, and yet there was nowhere to hide. i was both haunted and at peace at the same time. neither the desert nor the stars cared for where i’d been or where i was going, who i thought i was or who i really was. they demanded nothing from me but truth. my truth. either one could kill me in an instant if they so desired, and yet they sat quietly, the power of their silence subduing me. i retreated to my tent for the night. “what an incredible place the world is,” i thought to myself as i drifted off to sleep. 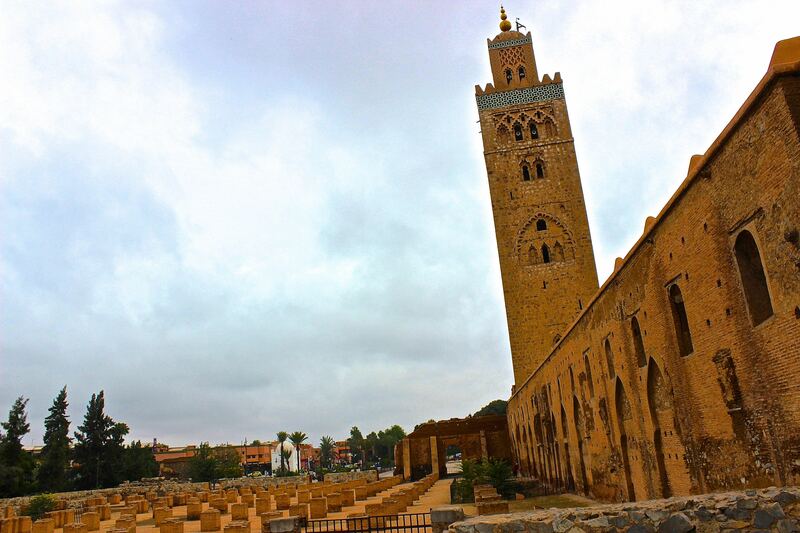 we spent another day in marrakech exploring the city. 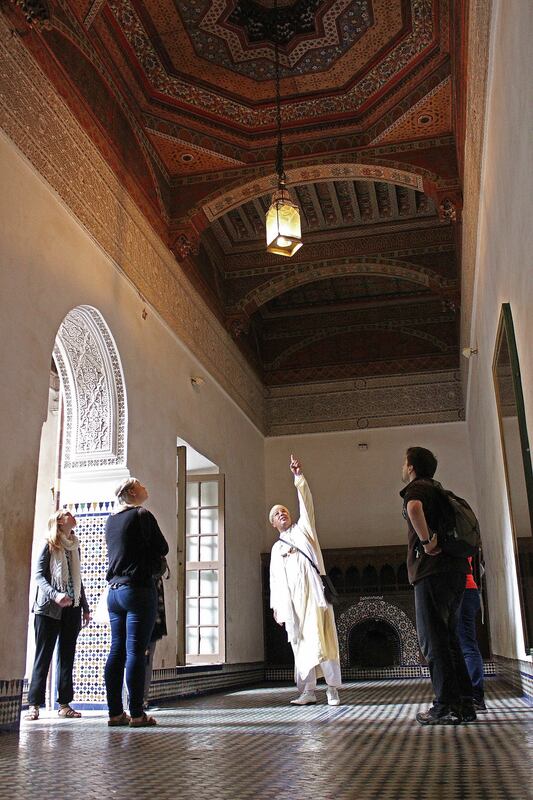 we visited the koutubia mosque, the famous 800+ year old minaret that towers above the rest of the city and the gardens around it, and listened to the call to prayer as we walked through the gardens surrounding the holy center. it was my first time really hearing a call to prayer that wasn’t on youtube or something, and i remember being curiously struck by it. i really didn’t know what to think of it. i wondered what they were saying. i wanted to go to the source and watch, but i knew this wasn’t really a thing for tourists inside. it was a place for worship. zuzu steered us toward djemaa el fna. pedestrian does not have the right of way. if you’re dumb enough to get hit by a car here, it’s your fault. it was a little disconcerting at first, but the longer i spent in the country, the more i liked it that way. as my plane approached low over the desert city landscape of marrakech, i was a confusion of thoughts and feelings. i was really excited, and ready for adventure in the unknown, but i also had never been to a third world country on my own without any help before, or africa for that matter. i had no idea what to expect, and this also would be my first time to travel to a country with such a significant muslim presence, and that also made me a little nervous. it’s one thing to be open-minded and religiously tolerant in the USA, but things shift dramatically when you leave home and suddenly you’re the minority, especially in these times we live in. you begin to realize how little you know about the world, no matter how “aware” and “informed” you consider yourself back home. 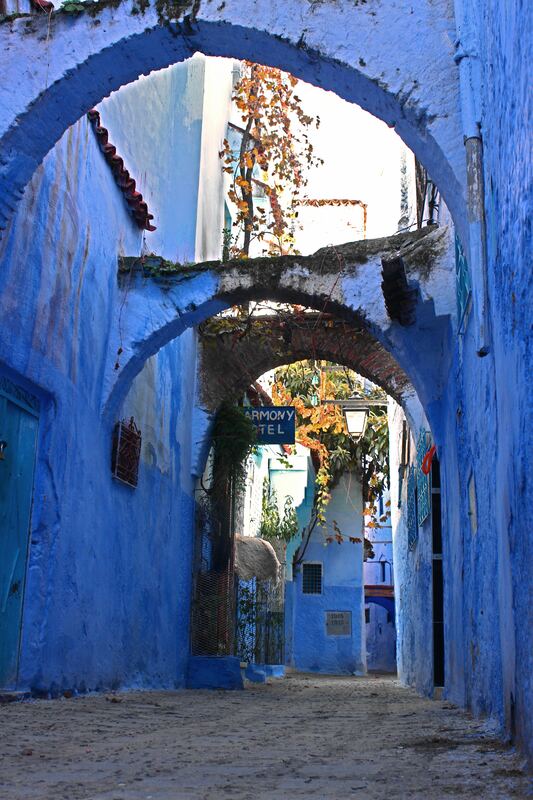 which is why i hired a guide for my first week in morocco. when i landed, i still hadn’t booked an exiting flight yet, but i had an idea that i would be in the country for more than two weeks and less than three, so i figured the best way to get my bearings about me was to hop in with a guided tour until i felt comfortable to strike out on my own. i know some adventurers would view this as cheating, but this turned out to be one of the best decisions i made on my entire trip.